In this week’s update we take a look at some WIP assets. 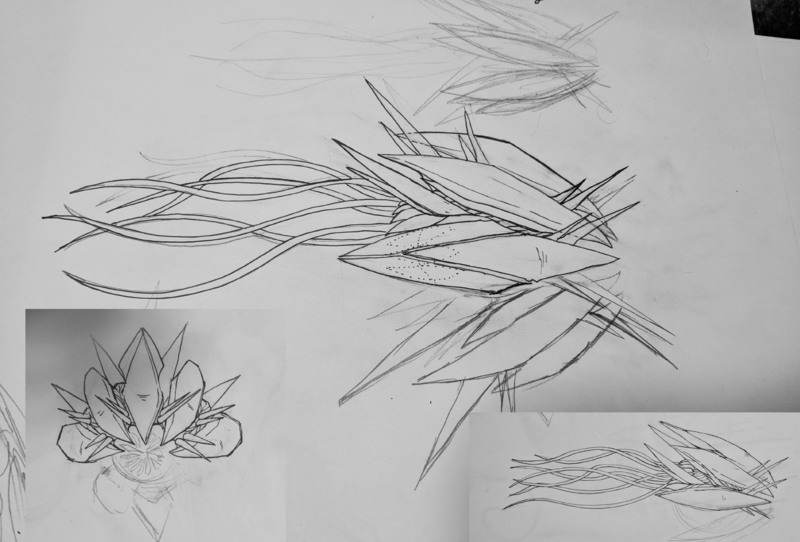 From the concept art for the the new Crystalline Silicoid as well as a new more optimal method of Asteroid Destruction (allowing for those AMD cards to work better and allow for more features to be plugged in for destruction). As we develop new weapons to combat the Silicoid threat, the alien menace themselves have also been evolving themselves. New versions of the Silicoid have revealed themselves with more of those Crystral spikes we’ve seen on the Worm. 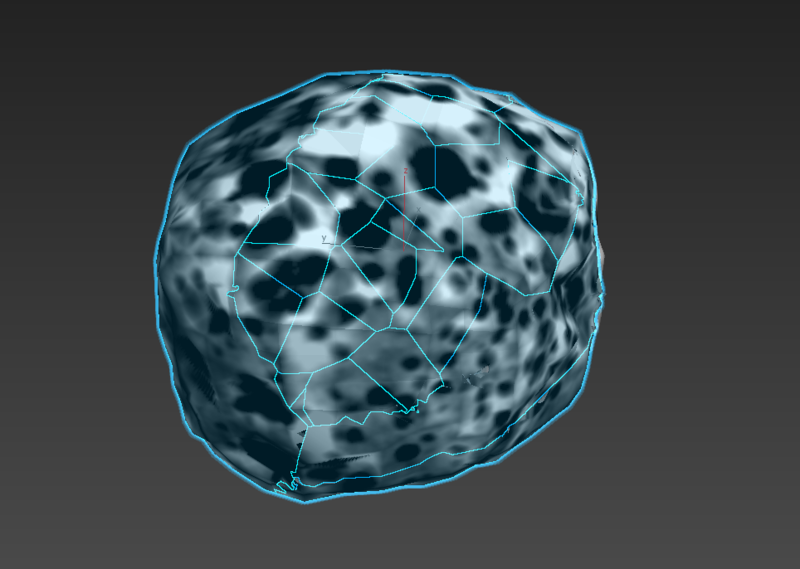 These new “Crystalline” sub species of Silicoid have shown to be much more adapted in sustaining damage from our electro-magnetic and other advanced energy based weaponry. They have even been seen in absorbing that same energy and delivering back at our vessels with even higher intensity than the regular Silicoid. Care must be given when encountering this new sub-species as energy weapons are not very effective on these creatures. These are Artist renditions of this newly discovered creature based on eye-witness accounts. 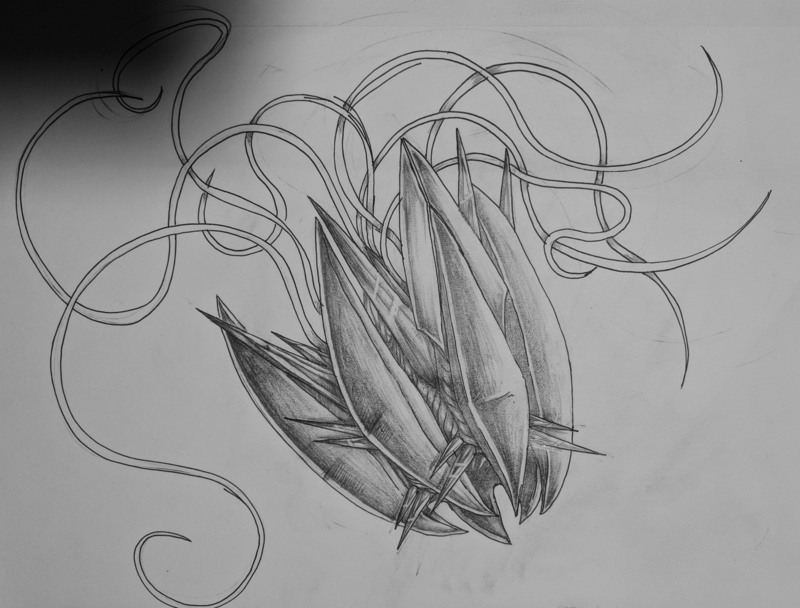 We will provide you with additional information on this new species once more intel becomes available. 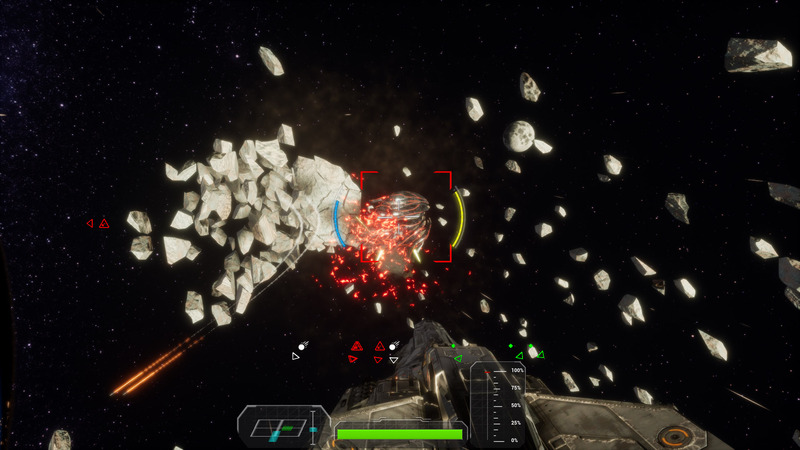 Since the Demo, we’ve been looking at the best ways to deal with the massive destruction of Asteroids and the performance impacts many AMD players have reported. This performance hit is not really that surprising as the current “Apex Destruction” plugin for Unreal is purpose built for Nvidia GPUs. This meant that anyone not playing with an Nvidia graphics card will likely encounter performance issues once more and more asteroids get destroyed. Along with the performance hits, there were many more obstacles we’ve been running into when using the “Apex Destruction” plugin. With all that in mind, and also with the Mega Meteor being a very large and complicated asset to setup with the Apex Destruction, we opted to look at making our own destruction tool, and that would be based on completely pre-broken assets. Instead of letting the Apex Destruction plugin tool create their own “Chunks” of the major pieces, we decided to author our own “Mini-pieces” that would be a subset of the major pieces that get broken off. These smaller pieces are all pulled in just on one easy asset and then handle separately once the break occurs. 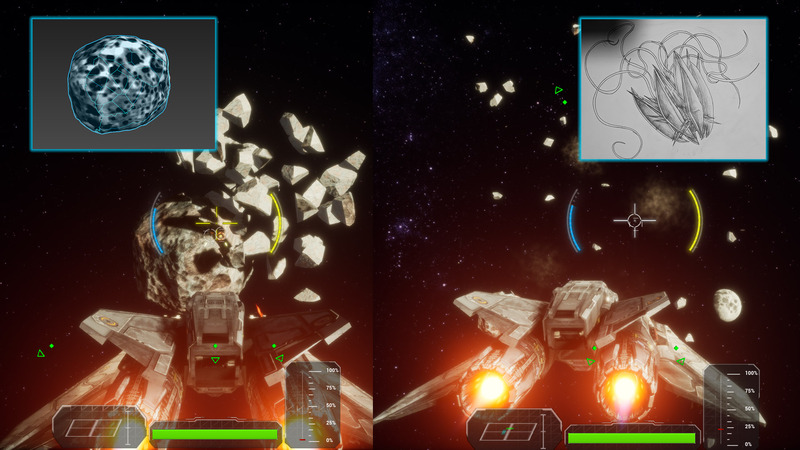 Our goal was to maintain the same level of quality that we had with the Apex Destruction which we achieved (left in above image), but also include additional features that we felt were missed out on, such as the “mini-pieces” to “Fade into dust” (right in the image above). This was a hugely missed feature that didn’t work properly in the Apex Destruction tool and now we’re able to set the up as we can handle the pieces on our own. 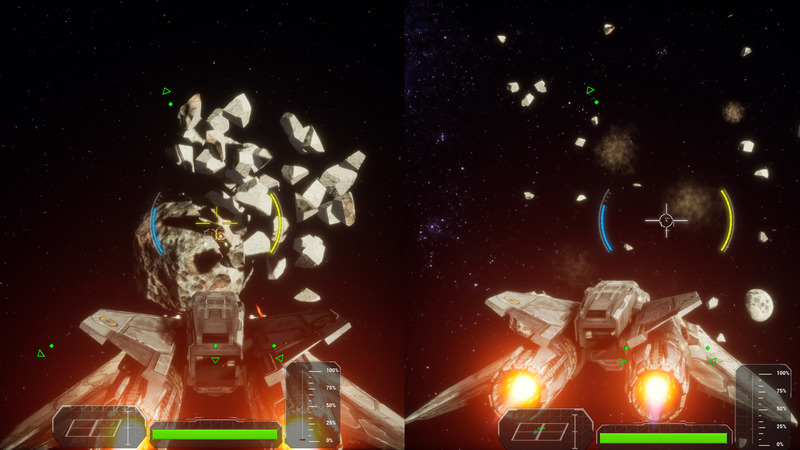 This change will also allow us to properly set the destruction of the Asteroids up to work as well in Multiplayer as well as handle “Health” values, without resorting to terrible hacks to force destruction. We haven’t yet fully tested the performance impact of so many individual pieces and suspect there may be a memory hit with so many individual specific meshes, but if that becomes an issue, we can always look at cutting back on the unique meshes on these major pieces or even create a sort of “debris-pool” where only a “Maximum Debris” count will be reached and then the oldest of these debris will fade to dust. And since these small mesh pieces are so simple, we’re not convinced that this will really cause an issue to begin with. Either case, now having total control over the Asteroid Destruction, we are now more confident than ever in increasing the quality of the destruction and gameplay before Alpha. Thanks again for tuning in to our weekly updates! We will see you all next week! 0 Comments ON " Dev Update – Crystalline Silicoid and New As... "